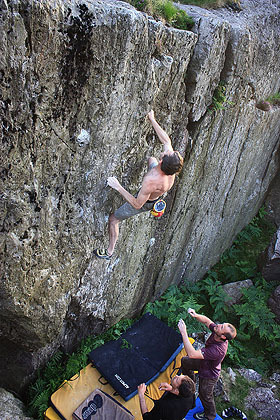 Si Panton and friends have added a range of excellent new problems to the Cwm Glas Bach area of the Llanberis Pass. 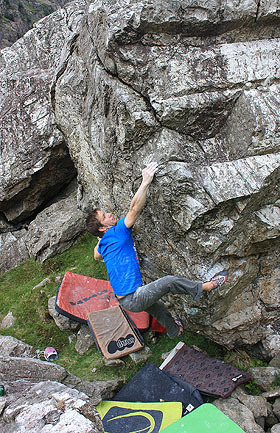 Research work for the new bouldering guide has revealed a surprising number of project lines and over the last few weeks a number of these have been picked off. The hardest line so far fell to Si last night when he climbed the undercut prow left of Nicotine Wall (a classic 6B in its own right). 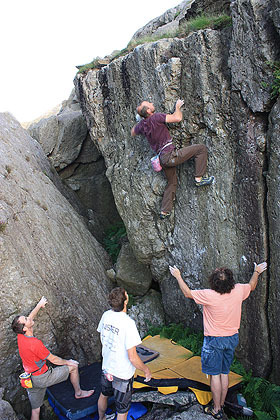 The Hand Rails of Crib Goch 7A+ goes from a sitting start on the left side of the arête and involves a series of tricky bear hug moves. The name incidentally should be sung to the tune of Windmills of your Mind. 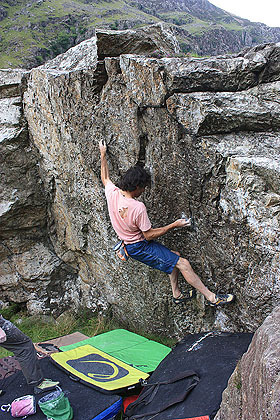 The previous week Ray Wood climbed a good sitter just to the left; Jelly Belly 6C+ makes a couple of slappy moves up before crabbing off leftwards to an awkward and frustrating finish. Last night Si climbed a superb direct finish with an improbable lurch move up to a side pull high on the arête. Jelly Head also rates 6C+. Ray also succeeded on the obvious line right of Nicotine Wall; Nicorette 6C+ pulls on with chest high side pulls. Tall climbers (and weak ones too!) may find this desperate. 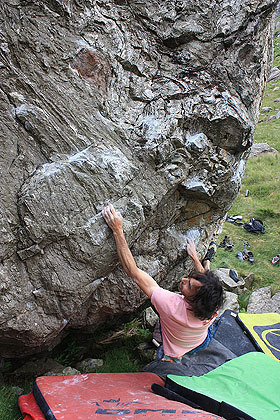 Ray went direct, but a second ascent from Gav Foster was done with a slap out right after the first move. The sitting start is an obvious, but hard project. 50m across the hillside to the right is The Turtle’s Head, a splendid 6B+ first climbed by Paul Pritchard back in the late 90s. 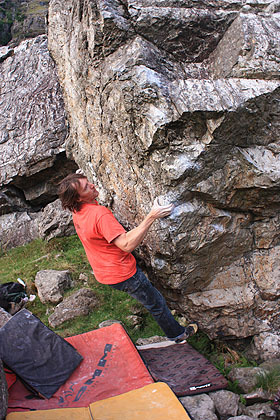 Andy Godber climbed a burly sds to this at 6C (ish), swinging around the break from a pull on at the far left side. 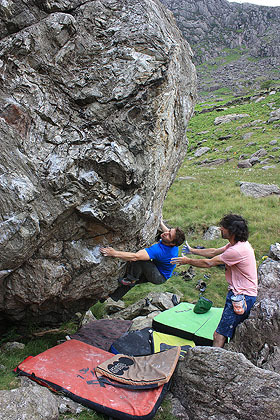 Up at Bryn Hel just right of Dave Noden’s Corridor’s of Power 7C+, Andy Godber maintained Welsh pride by narrowly beating Peak raider Andy Cave to the first ascent of Y Senedd 6C+. Mr Cave did get the consolation prize of the powerful right hand line on the front face of the adjacent block though. Goat Head also rates 6C+ (ish) and involves a big crank between two pockets. 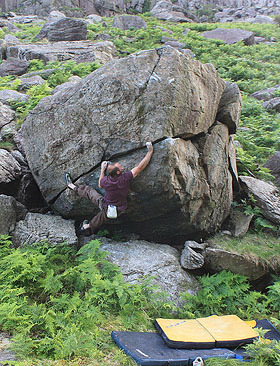 The whole Cwm Glas Bach area deserves more attention; there are around twenty grade 7s and even more quality grade 6s to go at, with some really impressive highball lines, plus well known classics such as Moose’s Toothpaste. Many of the walls stay in the shade too, which makes this a good area to visit during hot weather.